Bordered by Italy on the west and Austria to the north, Slovenia, a coastal sub-Alpine country in southern Central Europe, blessed with natural beauty is stunning. At first glance, when I saw the pictures you will be amazed, especially if you can view it directly with the naked eye. The lake is included in the Triglav National Park is the largest permanent lake in Slovenia. 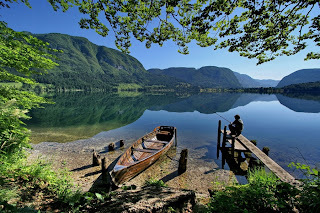 Bohinj lake stretching as far as 4.2 kilometers with a maximum width of up to 1 kilometer. It is a glacial lake dammed by the moraine. Besides its natural beauty, the lake is also surrounded by legend Goldhorn (Zlatorog), a white chamois with golden horns. In connection with this legend, a statue of a creature resembling a small deer could be found standing at the edge of the lake. Kras, also known as karst or karst terrain, is a limestone plateau border in the southwestern region of Slovenia which extends to the northeast of Italy. Kras is more precisely located in the Valley Vipava with low hills surrounding the valley, the western hills of Brkini, northern Istria and the Gulf of Trieste. Western edge of this plateau also marks the traditional ethnic border between Italy and Slovenia. From one side of the cliff, you'll see an amazing sight. As far as the eye could see, you'll see green bushes combined with white limestone at altitude, while underneath a beautiful expanse of blue sea stretches. Skocjan cave is a cave system in Slovenia. The cave is on the list of sites of natural and cultural world warisa UNESCO in 1986. International scientific circles have recognized the importance of this cave as one of planet Earth's natural treasures. Skocjan cave is an underground phenomenon is most significant, both in the Karst region and Slovenia. 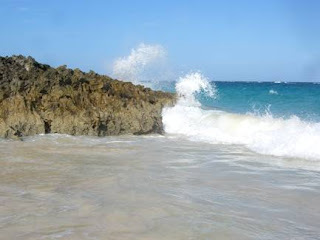 Being in this cave, you will see beautifully carved natural naturally carved in the rock wall. 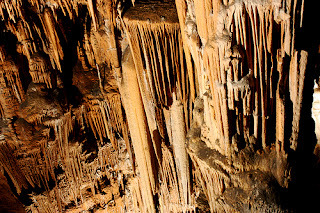 Postojna cave is a karst cave systems along the 20 570 meters near Postojna, Slovenia. 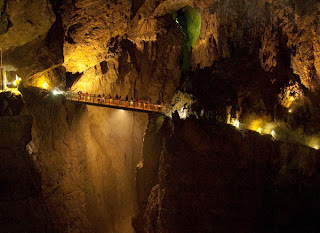 This is the longest cave system in Slovenia and one of the top tourist sites in the country. Section 5.3 kilometer long cave is accessible to the public, the public system makes it the longest of any cave system in the world. Created from the caves Pivka River has a railway line in it. Railway was first laid in 1872 which is also useful for transporting tourists. Vilenica cave in Lokev is the oldest show cave in Europe. The first tourists in these caves have been recorded there since 1633. Until the mid-19th century, known as the Cave Vilenica biggest cave, the most beautiful and most visited of the Classical Karst type cave. 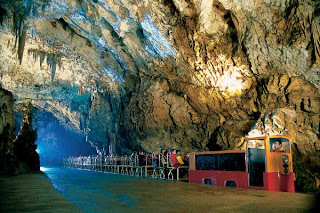 Vilenica cave has a length of more than 1,300 meters with a depth of 180 meters. Travelers are only allowed entry to a depth of 450 meters from the cave first.